Early Warning opens in 1953 with the Langdon family at a crossroads. Their stalwart patriarch, Walter, who with his wife, Rosanna, sustained their farm for three decades, has suddenly died, leaving their five children, now adults, looking to the future. Only one will remain in Iowa to work the land, while the others scatter to Washington, D.C., California, and everywhere in between. 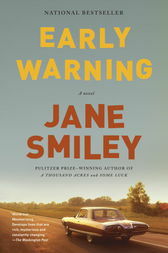 JANE SMILEY is the author of numerous novels, including A Thousand Acres, which was awarded the Pulitzer Prize, and most recently, Some Luck, the first volume of The Last Hundred Years trilogy, long-listed for the National Book Award. She is also the author of five works of nonfiction and a series of books for young adults. A member of the American Academy of Arts and Letters, she has also received the PEN USA Lifetime Achievement Award for Literature. She lives in Northern California.